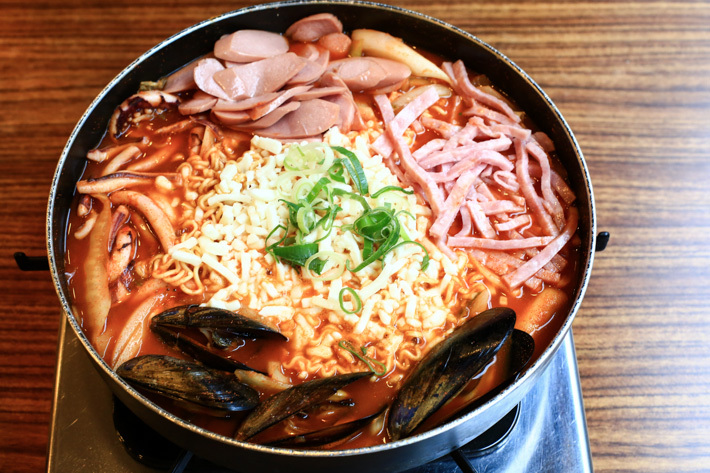 There are many one-pot goodness in the world – different varieties and all that – but there is nothing that has wow-ed us as much as Mukshidonna Tteokbokki Restaurant did. We are going to have you read on, and you have to, because if you go to Seoul and you miss this, you are really missing out in life. Mukshidonna Tteokbokki Restaurant is completely our idea of comfort, and it is so affordably priced that you can eat it often. Now, what exactly is the fuss that got us so excited? You are to find out in a bit. Mukshidonna Tteokbokki is really a simple restaurant that focuses on serving stews in a communal pot, and the stew is up to you to customise. The base is basically the same stock, and you pick from an array of ingredients to go into your pot. The result, no matter how you mix and match, is a hearty pot of sweet stew that bubbles with fragrance and has so much goodness inside. Every pot comes with tteokbokki (Korean rice cake) by default, and that is their signature. There are Seafood and Bulgogi options, both at W4,500 each. Then, there are add-ons such as Vegetables and Budae, which are at W4,500 per serving too, and the latter is quite simply sausages and ham. Staples include Ramyeon (Korean instant noodles), Oodong (udon) and Dangmyeon (vermicelli)—all at W1,000 per serving. And no matter what your combinations are, you totally have to add on the ‘Cheese’ (W2,000). Why do we say so? Because cheese adds texture to the stew and gives a savoury boost. And it just makes the whole pot a lot more gratifying when you scoop the ingredients and tear the shreds of melted cheese; cheese lovers will get it. We loved ours with the Bulgogi better. Budae and Cheese too, of course. By the way, you might be confused by the two Cheese options the menu. The one that is priced at W2,000 is simply cheese, while the W4,500 option is just more cheese and tteokbokki. So, how does this pot sound to you? 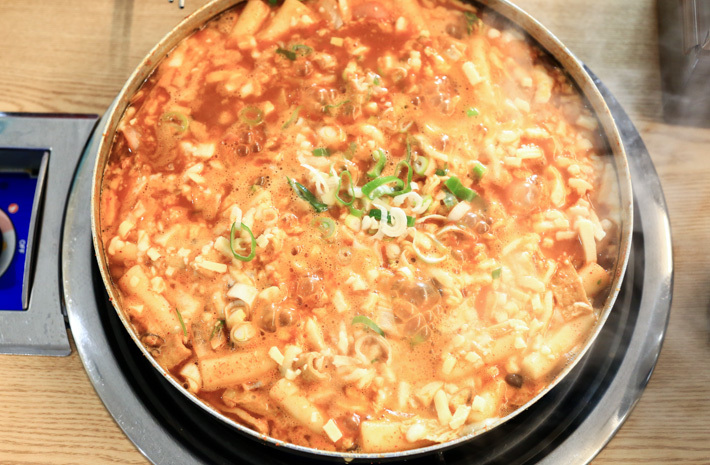 One thing’s for sure – every time we are in Seoul, we will definitely have a meal at Mukshidonna Tteokbokki Restaurant. It has several outlets in Seoul—including Garosugil and Hongdae—but you should dine at the original outlet at Anguk-Dong. For more recommendation, read our food & travel guides to Seoul. Hello, i’m not fluent in korean. I was seeking for mukshidonna’s email for so long but i can’t find any clue because it’s website was in korean. Maybe if you can help me figure it out i’ll be so much thank you for your help. Regards.